The vielle or medieval fiddle was the most popular instrument in its heyday for secular song accompaniment. It first appeared in western Europe in the 11th century and continued to be played until the middle of the 16th century, flourishing in the 12th and 13th centuries. There is a wealth of vielle iconography, which can tell us a great deal about the variety of its form and the context of its use. 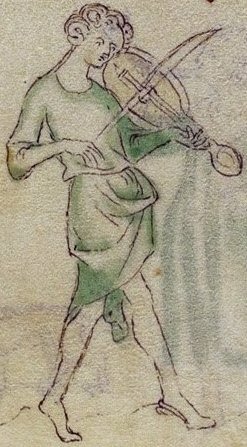 There is a medieval source for its tuning, Jerome of Moravia in the 13th century, who gives 3 tunings, leaving us with some puzzles as to what exactly they mean in practice, which this article attempts to resolve. Our only renaissance tuning source is Johannes Tinctoris in the 15th century, which isn’t entirely clear in its meaning. This page provides a detailed discussion of the different ways in which we can make sense of historical fiddle tunings and, in the light of that, a closely argued case for the relationship between the vielle and the crwth or bowed lyre, demonstrating that they were identical in style, having more in common with the hurdy gurdy family than modern bowed strings. There are two editions of this article. This one included detailed analysis. For an introduction for the general reader, go to On the (medieval) fiddle: a short introduction to the vielle.